Toldot Yaakov Yosef, commentary on the Torah according to Chassidic teachings, by R. Yaakov Yosef HaKohen of Polonne. Korets: Tzvi Hirsh son of Aryeh Leib [Margolies] and son-in-law Shmuel son of Yissachar Ber Segal, . 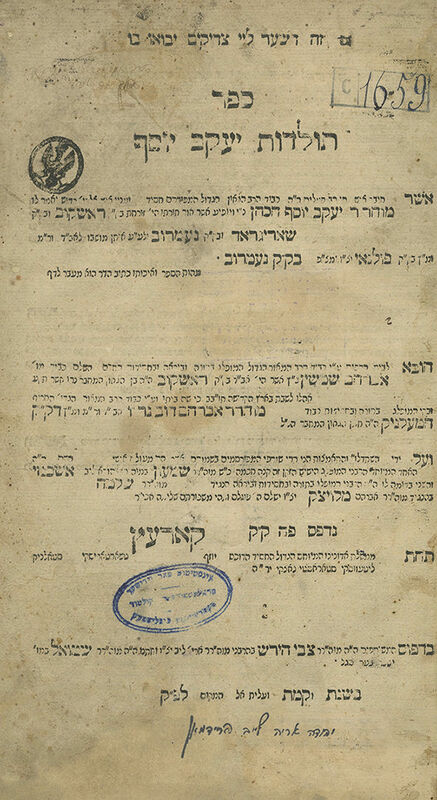 Toldot Yaakov Yosef, the first Chassidic book to be printed, was authored by the kabbalist R. Yaakov Yosef HaKohen of Polonne (d. Tishrei 1781 - Chassidic lore records that he was born in the 1660s, ascribing him a life of close to 110 years), a leading and close disciple of the Baal Shem Tov and the first to disseminate Chassidism. This book is the most important and authentic source of the Baal Shem Tov's teachings, containing over 280 references to teachings the author personally heard from the Baal Shem Tov, emphasized throughout the book and beginning with the words "I heard from my master". This book was especially cherished by Chassidic leaders, who ascribed it great holiness. The Maggid of Mezeritch (Mezhirichi) commended the author as having merited revelation of Eliyahu and reached lofty heights. R. Pinchas of Korets attested that a book of such stature has never yet existed, and its teachings originate from Heaven. He would customarily say that all new books do not totally conform with the truth, except for the books of the rabbi of Polonne which are "teachings from Paradise", and that with each quotation "heard from my master" one can resurrect the dead[!]. The Saba of Shpoli (Shpola) would recommend putting this book under the head of an ill person as a segulah (LaYesharim Tehilla). Before immigrating to Eretz Israel, R. Menachem Mendel of Vitebsk met R. Pinchas of Korets who queried "Why did the rabbi from Polonne print one thousand books at the price of one gold coin per book; had he printed a single book, I would have paid for it a thousand gold coins…". During the course of the battle against Chassidism, this first edition was publicly burnt in Brody and other places, which accounts for its extreme scarcity (Encyclopedia L'Chassidut, II, p. 277). Faded ownership inscription on title page: "The famous rabbi… R. Baruch Asher", presumably referring to Rebbe Baruch Asher Twersky (d. 1905), youngest son of Rebbe Aharon, the Maggid of Chernobyl, and from his mother's side, the grandson of R. Aharon of Titayov grandson of the Baal Shem Tov. He was the son-in-law of his uncle (his father's brother) Rebbe Moshe of Korostyshiv. From 1872, he succeeded his father as rebbe, together with his brother R. Yeshaya Meshulam Zusha (d. 1881). He served as rebbe to thousands of chassidim. He was renowned as a holy man, who would pray extensively on behalf of the Jewish people. His faith in G-d was legendary, and he effected salvations. He was an outstanding Torah scholar, and would debate in halachic topics with his cousin Rebbe Mordechai Dov of Hornostaipil. Stamps on the title page. , 202 leaves. 31 cm. Good-fair condition. Most leaves in good condition. Stains. Dampstains. Worming to title page and a few other leaves. Marginal tear to title page and last leaf, repaired, and tears to another leaf in middle of book, repaired. Several leaves trimmed close to text. Perforations to inner margins from previous binding. Stamps. New leather binding.